The data in the table below have been compiled from various sources including recently declassified documents obtained by Charles P. Vick who has kindly made this material available to me for this analysis. A striking feature of this table is the time from launch until the end of the trans-lunar injection (TLI). The TLI for Zond-5 is known (Launch + 67 minutes) from Soviet sources but it is unclear if it is the beginning or end of TLI. The TLI time for Zond-6 in the table is from Soviet data, while the Vick sources say it is approximately 75 minutes. The Zond-7 and Zond-8 TLI times are Vick's data. The burn time for the Blok-D rocket stage during injection of the Zond spacecraft was about 500 seconds, i.e. 8 minutes 20 seconds. If 8 minutes are added to 67 minutes we obtain 75 minutes, so it is possible that the differences in launch-to-TLI time in the table are not as large as they seem. The flights marked red in the table made an approach to the landing zone by flying over the South Pole, while those marked blue came in over the North Pole. In case of Zond-4 the TLI moment, i.e. the instant of burnout of the Blok-D stage, is rather well known. I made some slight adjustment to the position by estimating how much further along the parking orbit ground track the stage was at TLI. I used the semi-major axis of the orbit as determined below. The graph below shows the "departure ground track" for Zond-4. No surprises. This is an interesting case. The spacecraft had to return along a course very similar to the one it was launched on if they wanted it to be recovered near Baikonur (Dzezhkazgan for example). For this to be true (assuming the orbit axis does not move much in inertial space) the flight duration must be an integer number of sidereal days. In this case it comes back after 7 days, and seven sidereal days is exactly 7 x (23 h 56 m 4 sek) = 167 h 32 m 28 sek. The injection into the elliptical orbit took place at about 1948 UT on 2 March. It passed the Gulf of Guinea at 2120 Moscow Time (1820 UT) on 9 March according to Chertok (1). These two times are separated by 166 h 32 minutes, i.e. an hour short of exactly seven days. So, the re-entry trace was about 15 degrees to the east of the departure trajectory – which had an equator crossing at 10 W. So, the re-entry path crossed the equator at 5 deg E, right smack dab in the Gulf of Guinea, off Nigeria (as Boris Chertok states in ). According to Chertok the spacecraft made a ballistic descent and was blown up by its own destruct charges over the coast of Africa. This was done to prevent the re-entry vehicle falling into foreign hands! So, the elliptical orbit had a period of about 166.55 hours. If the orbit was purely Keplerian this corresponds to an apogee of 294 000 km! Quite a bit from what the literature says. This is of little consequence for plotting the re-entry path. It must comply with the discussion above. An apogee at 354 000 km would have implied an orbital period of 219 hours, i.e. 9 days, which is obviously not correct. The graph below shows the intended return ground track. 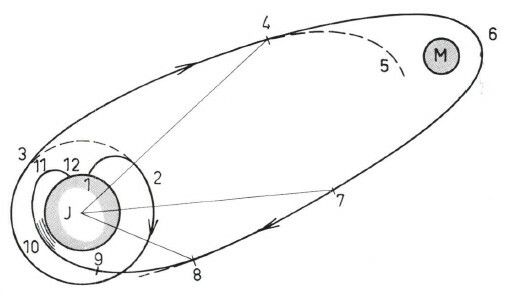 Anyway, the Zond-5- departure trajectory shown below was adjusted with a flight-path angle that made the spacecraft pass as close as possible to the Moon when using a patched-conic approximation of the trajectory. Therefore, it is probably reasonably representative of the real flight path. I computed the semi-major axis of the return ellipse based on the inbound flight time from the moon. I assumed a very high inclination. i= 86 degrees connects the actual landing point with the intended landing site. I tried some i>90 deg paths, but they appear not to match the constraints of actual and intended landing spots. Then I adjusted the epoch so that the perigee would occur near recovery (1608 UT on the 21 September 1968). After that I adjusted the right ascension of the node (RAAN) so that the orbital path would go through the actual landing site and the intended site. Finally I fine-tuned epoch and RAAN to fit what I think is the proper time near perigee to match the 1608 UT landing time. This can be several minutes off. This is what it looks like. Fascinating loop! In the publication Astronautisk Revy, issued by the Swedish Interplantery Society (2), there is an article on Zond-6 by a well-respected Swedish space expert, Björn Bergqvist. In that article he claims that the course correction made on the outbound trajectory leg was such that - if it were not made - the probe would not reach out to the Moon. The figure below from the article illustrated that statement. Has anyone heard about this before? I have not. It sounds plausible - some kind of safety precaution, perhaps. Astronautisk Revy, no 2-3, 1968, p.5.